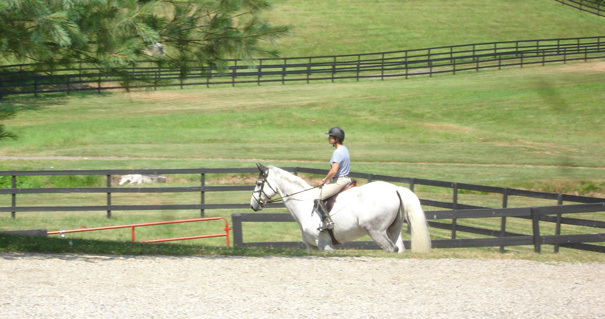 Choosing a barn to board your horse can be an exciting but daunting task. Do you envision your horse enjoying huge, lush green grass turnouts encircled by freshly painted white fencing, surrounding one (or two) stadium-sized outdoor rings with lighting, sound system, and the best all-weather footing, situated next to a cross-country course with idyllic natural obstacles overlooking an impressive covered/indoor riding ring with a massive barn attached enveloping spacious 14 x 14 stalls with large windows, plenty of light and breezy airflow as the centerpiece of this dreamy setting coming complete with his own groom to attend to his every need? If you do, you’re not alone but you’ve also probably smelled a bit too much hoof oil. As the head of SmartPak’s Barn Programs for over three years, I’ve lost count of how many barns I’ve been fortunate enough to visit across the country. Along with the team of riders at SmartPak, we decided to give you some factors to consider, that you may or may not have thought of, and a suggestion on how to narrow your options to one or two final candidates. There are some obvious factors to take into consideration when choosing the right barn for you and your horse, such as location and budget. There are some less obvious factors, like proximity to riding trails or how crowded the indoor ring may get on a rainy Saturday morning that maybe you hadn’t thought of or that just may not be as important to you. So first we’ll give you a list of the more popular considerations and then a method to help you rank them. Some riders couldn’t imagine driving more than 15 minutes to see their mounts and some have over an hour in the car to commute to work, so driving is part of their lives (like me!). 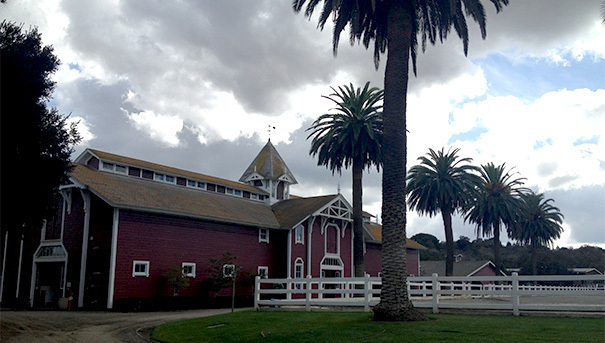 You need to decide where you want your barn to be in relation to your home and workplace. Choose a radius of 10, 20, or 50 miles to start. 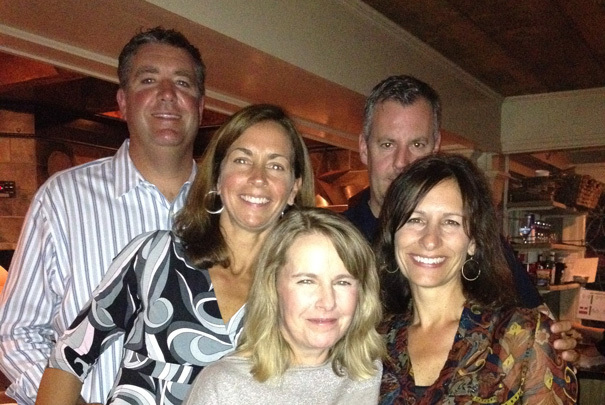 You can always increase your radius if your choices are slim. This isn’t as easy as you may think. Of course you have to know what the basic board price is, but ask details about what services this includes. Your checklist may include daily stall cleaning, turnout, blanket changes, feeding grain two times/day including SmartPaks and medications, hay three times/day, and more. Some barns spell out these services clearly on their website or their board agreements but some don’t. Make a list of what services you want included and ask about them specifically with the barn owner or trainer, whomever is responsible for providing these services on a regular basis. 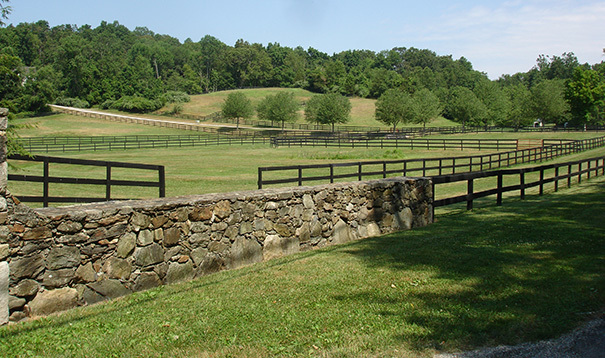 If you can’t find that dreamy barn I mentioned earlier, or if it is out of your budget, you need to decide what is non-negotiable in terms of the facility amenities and what are “nice-to-haves.” The size of the stalls or run-outs, quality and size of the outdoor ring, if it has an indoor ring, access to trails or cross country course, sand vs. grass paddocks are all common considerations. Also take into account how many other horses and riders will be using these amenities to help determine how this will affect your riding or your horse’s turnout experience. If you’re looking for professional training for yourself or your horse, you’ll want to know if there is a qualified person onsite employed by the barn owner, running her own business on the property, or if you’re able to invite your own professionals to the property for lessons or training. For some competitive riders, boarding their horse with a specific trainer is the top reason to board at that barn. I’ve spoken to many trainers, specifically in western disciplines, who only offer training board. 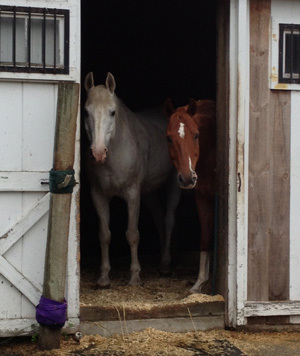 The horse owner sends their horse to their barn for training, but does not go there to ride on a regular basis. The trainer will train the horse for the owner then send the horse back or meet up at horse shows so the owner can show the horse. Decide what level of training you want for you and your horse, then research the trainer, look up their show history if available, and by all means, discuss what your expectations are with the trainer before going forward. Clear communication is optimal to ensure your expectations are met. 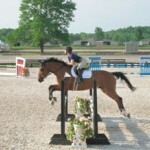 If you’re a hunter/jumper, you may want to choose a barn where jumps are always available in the rings, where you can get H/J lessons, or where the on-site trainer travels to the horse shows you wish to attend. If you’re a barrel racer, you may not want to have to move jumps in order to set up your barrels. It’s tough to practice on course if you’re an eventer without access to a cross-country course or a trailer to get to one. 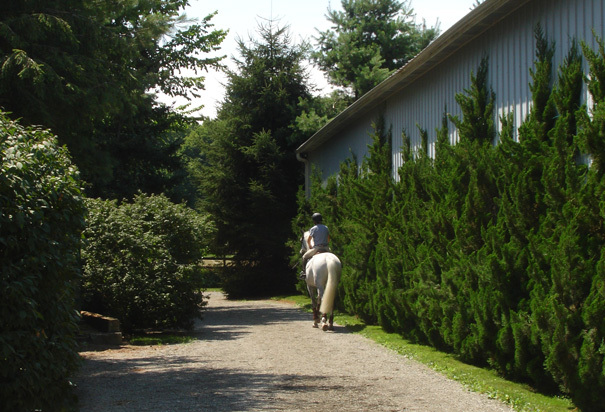 Having said that, if you’re a pleasure rider who doesn’t want to compete or take lessons, you may be perfectly happy at a multi-discipline barn where everyone can enjoy their own style of riding. 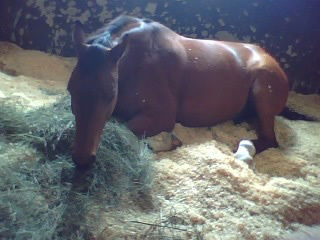 Then there’s the retirement barns where taking care of retired horses is their focus. If competing at horse shows is a goal of yours and you’d like a trainer available, check with her to see if she has a planned horse show schedule for you to review. Conversely, if you don’t want to horse show but want a trainer available, if the trainer is away 50% of the time traveling to horse shows this would obviously make her unavailable to train you or your horse during that time. This is something of top consideration for many of us who want the very best for our horses. Some barns offer a “full care” suite of services that includes all the basic board services plus grooming, tack-up, training rides and sometimes lessons too. 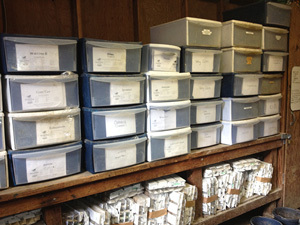 In these cases there is usually a full-time barn manager and a team of grooms to take care of 100% of your horse’s needs, whether you show up to the barn or not. This may be appealing to some, but can be beyond your budget. The opposite end of the spectrum is boarding your horse at home, at a neighbor’s, or at a co-op facility (where you are typically required to provide all the care for your horse, including sharing responsibilities for other horses in the barn). Regardless of which you choose, you should evaluate how your horse will be cared for to make sure it is in line with your expectations. 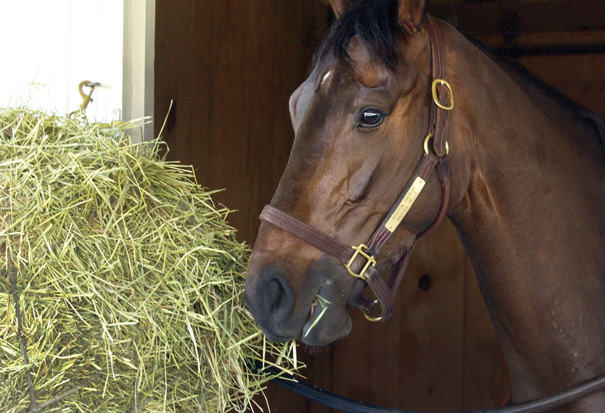 Think about quality/quantity of shavings if he lives in a stall even part of the time, quality of hay, line of feed products available, knowledge of staff handling your horse, as well as access to and quality of veterinary and farrier care. 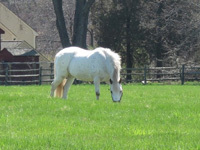 Think about specific health issues your horse may have. Is he prone to thrush and needs regular attention? Do you want him turned out with a fly mask and fly sheet every day, and can this be provided? 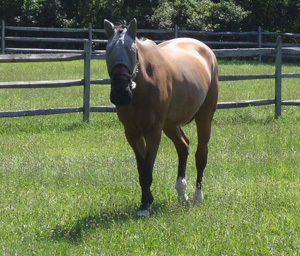 Do you have a senior horse that has arthritis and want him to be watched over a bit more closely? As with many of the other considerations, this is one of the more complex considerations. I personally have made great friends that I may never have met otherwise (despite the fact that we competed against each other at the same shows) simply by boarding our horses at the same barn. The community of riders, trainers and staff at a barn can sometimes make or break your experience. Other riders around your age, riding ability, your child’s age, that have shared interests like showing, trail riding (or post-ride wine and cheese parties!) could be more important than you think in making your final choice. Consider setting up a visit at a prospective barn to meet some people, watch a lesson or just be able to mingle with the barn community before making your decision. 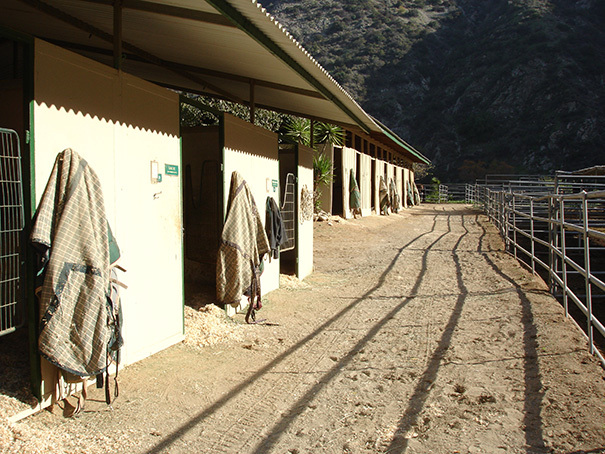 Some barns only allow certain veterinarians, farriers, chiropractors, massage therapists, or dentists in to provide care to the horses that board there. It may be important to you to chat with the vet or farrier prior to moving your horse in or doing a bit of due diligence on them to ensure their care philosophies are in line with yours. At the minimum, you’ll want to ask if a vet would be available on-call for emergency situations, who that may be, their rates, how far away from your barn they are etc. Don’t forget if you’re not available to meet a vet or farrier, find out if someone on staff at the barn would be and if they charge anything to provide that service to you. 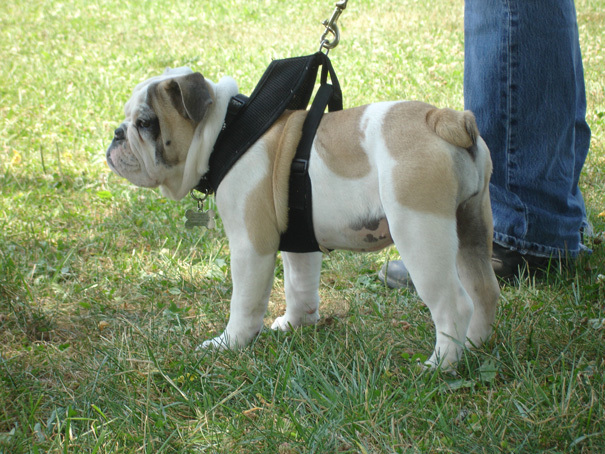 Other considerations may include availability of storage (for trunks, gear, tack, equipment), ability to leave your truck and trailer on site, ability to borrow a trailer if needed, or even whether or not you’re able to bring your dog to the barn to hang out. Before you can feel assured you’ve made the best decision, creating a ranking table such as the example below may be helpful. Make a list of all the considerations you’d like to include when evaluating a barn, then a list of barns that are in the running. I suggest using a scoring system of 1 – 10 to score each consideration, then a total of the scores will bring you to a “rank” for each barn. In this case, the highest ranked barn would be the most favorable choice. Barn C scored the highest overall but notice this does not take your priorities into account. All of the considerations in this example are scored equally 1-10, so if location is more important than the others, you may use a score of 10-20 to score that consideration, for example. This higher scoring system will allow location to be more heavily weighted if that’s what most important to you. Lastly, and some could argue most importantly, try to have a good idea of what your goals are as a horse owner or rider. If you want to be a competitive dressage rider, reiner, or practice natural horsemanship, this should be the overarching theme of your barn decision-making process. If you’d like a lovely place for your retired horse to live out his years, your list of considerations would most likely be very different than the rider hoping to make it to Rolex. Though this is certainly not an all-inclusive list of considerations, I hope you find it a good place to start to help you achieve your riding and horsemanship goals and help your horse look and feel his very best. Thanks for tuning in and we’d love to hear about your progress in choosing the right barn for your horse. A well-written and interesting post Susan. Thank you for sharing your tips with us. Thank you this is well written and great advice. Love the scoring system this really takes the emotion out of the decison and helps focus on what is most important to each individual. Susan what a great post! You covered so many practical considerations when choosing a barn. I really like the ranking system, awesome idea! Enjoyed reading this well written blog! It should help a lot of horse owners/horse lovers!